I am really glad that I’ve finally got down to it – and to have discovered the start of a new series that I’m sure I’ll want to read in full. Helen didn’t start out as a self-published author. Her books were published to great acclaim by a major trade publishing house until a couple of years ago when they decided, for reasons best known to themselves, not to continue. 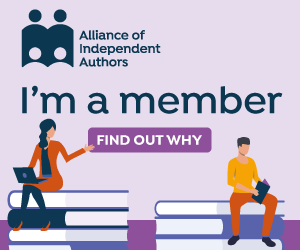 Confident that she has a considerable fan base of satisfied readers around the world, plus a highly-respected status within the Historical Novelists’ Society, Helen decided to take her fortune into her own hands (in every sense) and self-publish. After one false start with a less than dependable supplier, Helen plumped for SilverWood Books and hasn’t looked back. She now has a string of beautifully presented books (such fabulous covers!) in two strands – her Arthurian tales from the Dark Ages and her “pirate-fantasy” series of the late 1600s/early 1700s, as featured in the “Pirates of the Caribbean” films, themselves dreamed up to expand upon the world so vividly created in the Disneyland theme parks’ “Pirates of the Caribbean” ride – one of my favourites since first visiting the California Disneyland as a child and still just as good, decades later, in its incarnation at Disneyland Paris. Needing a bit of sunny escapism during a bout of bronchitis before Christmas, when I planned to catch up on some reading, I decided that Helen’s pirate series would just hit the spot – and for the next couple of days, I was glued to my Kindle whenever I had the opportunity, racing through the colourful adventure that is Sea Witch. And what a rollicking read it was! 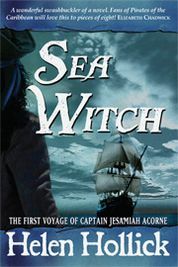 Exciting, romantic and so vividly written that I felt like a stowaway on each of the many ships commandeered by the charming pirate hero Jesamiah Acorne (or Oakwood or whatever other pseudonym he takes to save his own skin along the way). Both hero and heroine are willing to fight for what is right according to their personal moral code, rather than obeying the letter of the law, and the contrasts between hero and villain, law and criminal, of that era are thought-provoking for the 21st century reader. Throughout the book, I was very impressed with the attention paid both to fascinating historical detail (always skilfully woven into the story) and the alluring descriptions of the sea and its sailing ships. Although the author confesses that she has taken a few liberties with history to make her story neater, to my mind these are entirely justified for the sake of such a compelling tale. 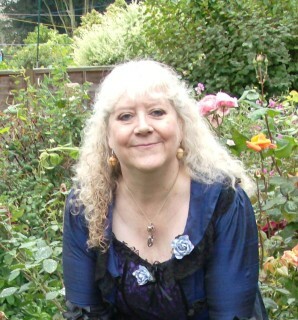 To find out more about Helen Hollick and her work, visit her always interesting blog Of History and Kings, where she also recently hosted a Winter Solstice blog hop, in which I was privileged to take part, and to which I contributed this short story: Fear of the Dark.